Blog What if I'm unsure about the flowers I selected? What if I’m unsure about the flowers I selected? Here at Sisters, we don’t work like a “normal” flower shop. When a bride meets with us, she is not meeting with someone who just takes an order, she is meeting with the team (Shelly & Emily) that will ultimately execute the design of all the flowers for her wedding. By the day of the wedding, we will have worked out details with multiple meetings and dozens of phone calls and e-mails. That’s why what occurred on April 26th was such a shock to us. Even though the colors and flowers types were specifically listed in our contract and chosen by Angie, we quickly learned she didn’t realize what she had ordered or what the different flowers would look like together. 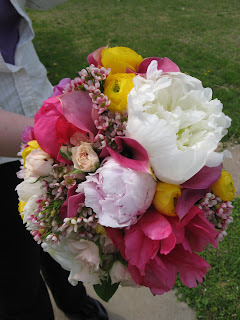 This is a professional shot of the replacement bouquet. So, what now, and why bring up a bad experience? The goal here is to ease the minds of our remaining ’08 brides. 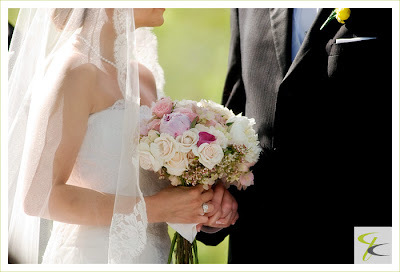 We’ve always welcomed brides who have wanted to come and see their flowers the week of their wedding. Some have made small changes, but most have been extremely happy. 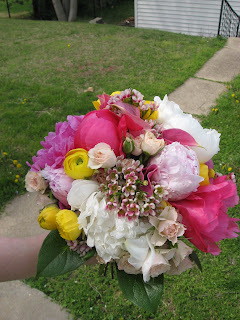 (One time, Emily even called a wedding coordinator the day before the wedding to say that the bridesmaids’ bouquets were designed as the bride wanted, but Emily had a concern that they may be a little more funky than what the bride intended. Both the coordinator and Emily agreed that it would be a good idea to have the bride come in and check it out. As it turned out, that’s exactly what the bride wanted.) If you are unsure of what a certain type of flower/color/design looks like in person, stopping in to check out your order is always an option. 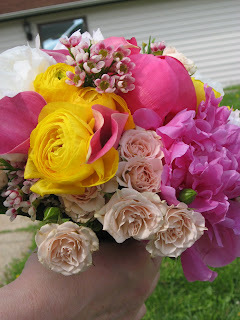 It is also VERY important that brides read the bouquet/flower descriptions on their contract. If anything needs to be clarified, it’s certainly ok to ask us. Thank you for reading our blog, hearing us out, and listening to our suggestions. Now, we have to get back to work! !